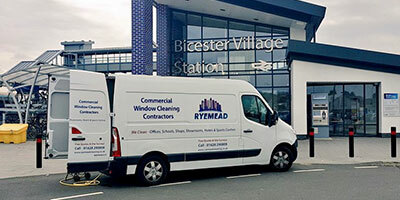 At Ryemead we adopt a strategic approach to Public Sector window cleaning and will work closely with our clients to develop a schedule that leaves no stone unturned. If you are responsible for selecting a window cleaning company for a Police Station, Fire Station, Court House or any other Public Sector building, you need a company that you can rely on at all times. Ryemead operatives are not only highly trained, but also personable and reliable which enhances your experience. We support this further with a Full Disclosure DBS check on all operatives to ensure safety and peace of mind. 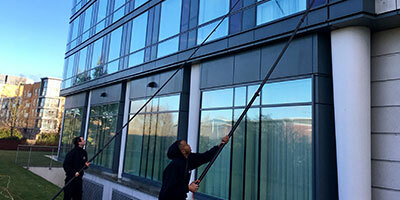 We have extensive experience servicing multi-site window cleaning contracts and single site locations. 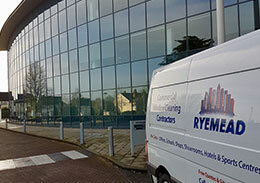 You can be safe assured that Ryemead will provide a professional, managed and fully audited window cleaning service. Our visits will be conducted at times that fit the requirements of your facility, taking into account public footfall and staff movements. We understand that busy car parks, important visitors and meetings can pre-determine the most ideal time for window cleaning to take place at your premises. We will work with you to formulate a time suitable for our teams to be onsite. 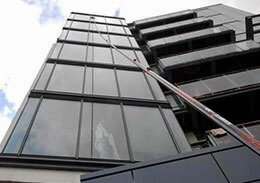 Utilising our extensive expertise, we clean windows up to any height and to any type of building. We find the safest and most cost-effective solution for your business while making sure of the best possible cleaning results. 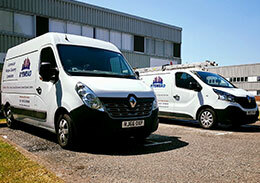 We cater for all of your needs and trust that our workmanship, reliability and customer service is unique. These are values we hold dear when dealing with all of our loyal and prospective clients. Our level of organisation and expertise provide you with the peace of mind that all of your vital window cleaning tasks will be meticulously scheduled and taken care of by our professionals. As well as external glazing, we also carry out scheduled cleaning to internal windows and internal office partition glass – a fitting that has become very popular within the modern office. Internal door glass can also be taken care of by our teams. Our experienced window cleaning teams are fully uniformed, polite and they arrive in clean, sign written vehicles. Our vans are fitted out with the very latest window cleaning technology and equipment including 1000 litre baffled tank systems that pump de-ionised, heated water up to 80 feet through state of the art extendable carbon fibre poles. A high level of service and customer satisfaction is something that we are committed to deliver. All cleaning visits to your office building will be booked in advance and fully documented. On completion of our visit, you will be asked to sign a satisfaction docket to ensure you are happy with our service. This also aids transparency and audit procedures for back office. All of our operatives are subject to a Full Disclosure DBS check, to ensure safety and peace of mind. We are proud members of the Federation of Window Cleaners, Fully Safe Contractor approved and ISO 9001 certified ensuring our commitment to continuous development in our processes and people. Before any work takes place, we provide our clients with full Risk Assessments and Method Statements, covering all aspects of any works we undertake at your premises including traffic management permissions and permits, if required. We are a proud member of the National Federation of Window Cleaners and all works are undertaken and managed following industry standard safety procedures. All relevant risk assessments and method statements will be provided prior to any work taking place at your premises.